It’s hard for me to believe The Duke has been gone for almost forty years. He passed on June 11, 1979, but he lives on in his films and his words. I did this pastel portrait art of him a while ago and had forgotten about it until I found a scan of it in on my computer. John Wayne always spoke his mind and the resulting quotes were truly words to live by. These are just a few of them. Click here for a great article about that phrase and more about John Wayne. Various public locations are named in honor of Wayne, including the John Wayne Airport in Orange County, California, where a nine-foot bronze statue of him stands at the entrance; the John Wayne Marina for which Wayne bequeathed the land, near Sequim, Washington; John Wayne Elementary School in Brooklyn, New York, which boasts a 38-foot mosaic mural commission by New York artist Knox Martin entitled “John Wayne and the American Frontier”; and a 100-plus-mile trail named the “John Wayne Pioneer Trail” in Washington’s Iron Horse State Park. A larger than life-size bronze statue of Wayne atop a horse was erected at the corner of La Cienega Boulevard and Wilshire Boulevard in Beverly Hills, California, at the former offices of the Great Western Savings and Loan Corporation, for which Wayne had made a number of commercials. In the city of Maricopa, Arizona, part of Arizona State Route 347 is named John Wayne Parkway, which runs through the center of town. 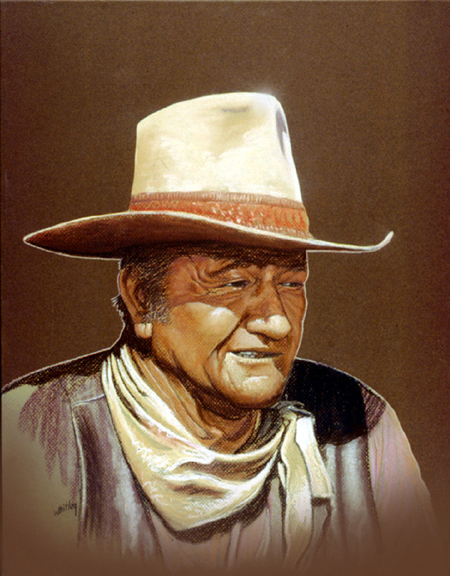 John Wayne was one of a kind; as an actor and as a man. He was larger than life and still is today almost 40 years after his death. I wish I still had the painting but I happen to know an artist who can do another one for me…! Stay tuned. I will be posting more portrait art in future posts. While you’re here, check out the rest of my website and my art on the homepage. Then please like, comment, follow and share this post!